Eggnog Ebook: Eggnog Lore and Recipes Galore--For Every Season of the Year! 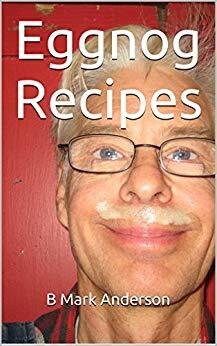 Eggnog Recipes is a one-of-a-kind recipe ebook. There’s not another like it anywhere! By taking the art and science of the incredible edible egg to mouth-watering heights, you will find more than 50 non-alcoholic eggnog recipes suitable for any day of the year. All of the 50 plus recipes can easily be made at home. Even a child can make most with minimal or no supervision. Only one or two of the recipes call for alcohol. However, spirits may be added to each recipe if you choose. Research studies verify what everyone instinctively knows—breakfast is good for you! Now there’s no reason for you or your kids to skip this important meal. Get Eggnog Recipes and you’ll find out how to prepare a variety of breakfast eggnogs you and your kids won’t want to miss. Studies show that kids who eat breakfast do better in school. The book features more than 50 recipes like. . .
Start by grating the oranges. Keep gratings separate. With a knife, cut off and discard any large portions of orange rinds that remain. Drop peeled oranges into blender and liquefy at increasingly high speeds. Add eggs, sugar and milk. Blend at high speed. In a separate bowl, whip the heavy cream into semi-solid consistency with a mixer. Fold whipped cream into the eggnog mixture. Pour into cups. 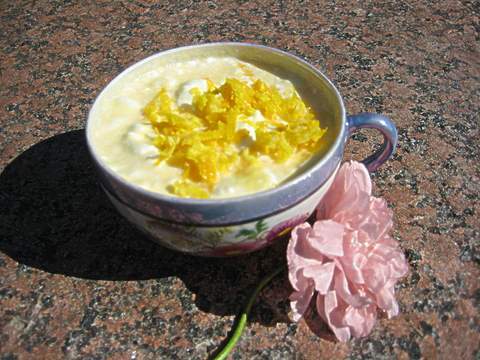 Top with grated orange rinds (and nutmeg, if desired). Recent headlines, based on scientific research, proclaim “Want To Lose Weight? Eat A Good Breakfast”. Why wait to lose weight? You can start tomorrow by getting Eggnog Recipes. These recipes have year-round appeal. Some use the fruits of fall, some the berries of spring or early summer. The book doesn’t leave out Christmas or the holidays. At least a dozen eggnog recipes give pizazz to your holiday party or Christmas celebration. Here’s a sample. Remove ice cream from freezer to soften. Combine eggs, half-and-half, and sugar in blender or mixer. Blend thoroughly. Pour into large punch bowl. Add softened ice cream. Slowly add 7-Up. Serves between 16 and 20. Eggnog Recipes is no boring read. A bit of humor will tickle your funny bone. It’s a great gift, and easy to give—just press the buttons. And it’s more than a gift. It’s something you or someone you care about can use every day of the year. Available on Kindle for only $3.99!